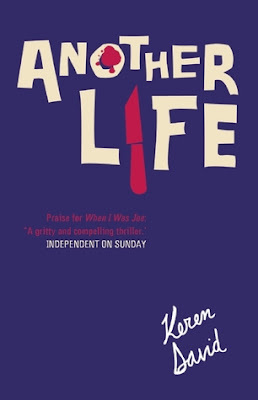 Another Life is the third and final book in Keren David's When I Was Joe series and is the gripping conclusion to Ty's story. Ty has been sentenced to 12 weeks in a Young Offenders Institute for carrying a weapon but the gang he testified against have a long reach and he is worried that he won't be safe there. Can he keep his head down and make it through his sentence without drawing unwanted attention to himself? This is also the story of Ty's younger cousin Archie. Archie is sick of being sent away to expensive boarding schools just so he is out of his parent's way, he is determined to get back to London and live at home so he can offer support to Ty throughout his sentence. After managing to get himself expelled from yet another school Archie's parents have no choice but to find a day school that will accept him as a student. As Archie tries to learn more about his cousin's past he finds himself drawn deeper into a world of gangs, violence, under age drinking and drug taking. Can Archie find the answers he is looking for or will he just end up bringing down a whole heap of trouble? I have to admit I was kind of sad to reach the end of this series, Keren David has created characters that I have come to really care about and that always makes it hard to reach the end of the journey, but at the same time I wanted to know how things would turn out for Ty. He has had it so tough during the events of the last two books and it doesn't look like things are going to get easier any time soon. It is easy to feel sorry for him, he was dragged into the gang by his best friend even though it was never something he wanted to join, then he witnessed a terrible event that has left him traumatised to this day and being brave enough to stand up and tell the truth about what happened has cost him and his family everything, not just once but over and over again. I don't think I would have coped as well if I found myself in Ty's situation! That isn't to say he is perfect, he has made plenty of mistakes along the way, but it was easy to see how he ended up making the choices he did. Deep down he is a good boy and all he ever really tries to do is protect his family and those he cares about. I found it strange at first having part of the story narrated by Archie, he has had a very different upbringing to Ty and I found his behaviour much more selfish and childish but you have to take into account that Archie is a lot younger than Ty and he has a lot less life experience than his cousin. As much as Archie can be irritating at times really he is also trying to do the right thing and he just wants to get to the truth about the events that led up to Ty's incarceration. Archie has questions about Ty's past and since nobody seems willing to give him any answers he decides to go and get them for himself. Yes, that means he puts himself into some dangerous situations, yes, I was frustrated with him on occasion, and yes, I could tell that certain things weren't going to end well but I never doubted that Archie's heart was in the right place and he really did grow on me by the end of the book. It's hard to say everything I want to say about this book without giving spoilers so I'm just going to leave it by telling you that Another Life is a must read conclusion to the series. I wouldn't recommend starting the series with this book but I do highly recommend the whole series starting from When I Was Joe. If you're looking for a series that shows the harsh and gritty side of teenage gang culture, knife crime and the shady side of London then look no further, Keren David has created a thrilling series that will have you on the edge of your seat. I hadn't heard of this series before so thank you! I'll be checking out this series.